Create responsive, complex Multi-Step formulas. A drag & drop-based back end makes it easy to create highly complex forms for e.g. user surveys. The animated progress bar is responsive too and shows – separated in steps – your users where you are in the form. Perfect for mobile access! 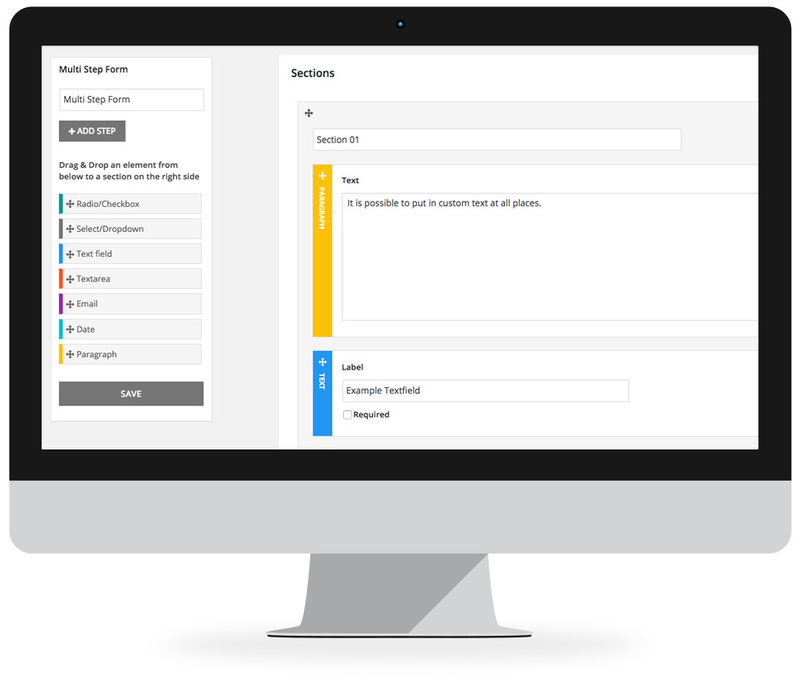 The Frontend of Multi Step Form is fully responsive. It can be used on all devices, be completed and submited from there. We made sure that the form output can be optimally displayed on all screen resolutions. Creating forms is as easy as never before. Use Drag&Drop to place the fields in your formular. These can be moved and rearranged at any time. The individual steps of the forms can also be moved so that the sequence can be changed or expanded afterwards. The back end is simply structured. Even untrained users can quickly understand the Plugin. Our Pro versions also offer user support. Multi Step Form will be continuously improved. 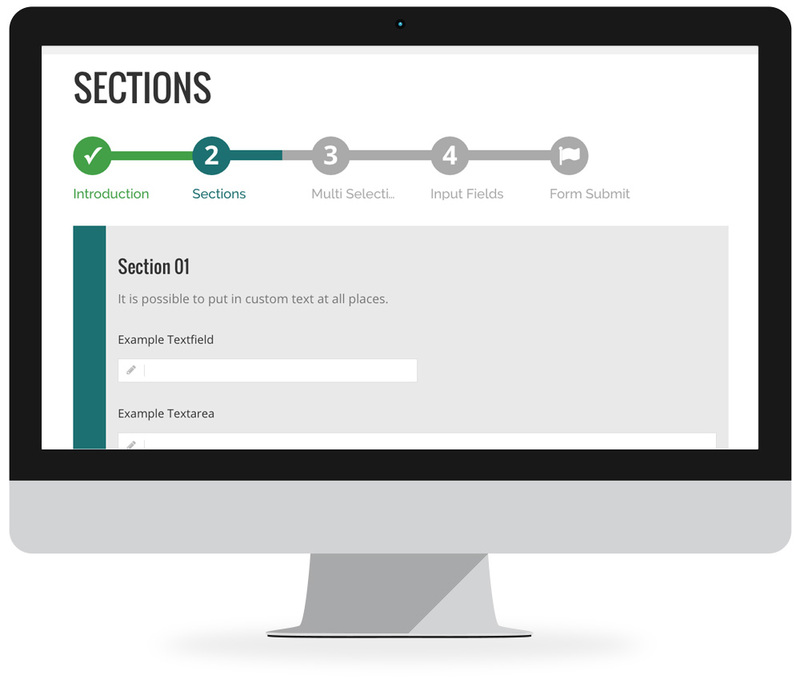 The free version provides a variety of exciting features for creating complex forms. In future the free version features will be continuously fully accessible. Further features, e.g. the display of evaluated reports or formatted output mails will only be available in the Pro version, which will probably be available in two release stages. Is it possible to add images or videos to each step? How? You can use HTML in a ‚paragraph‘ element. If you want to modify this wait for the Pro-Version upcomming the next month or you have to modify the code by yourself. Hi, you can choose more than one reciepient. Insert the adresses comma separated in the field in the backend. Different mails are not possible. Hallo, super Plugin! Aber Daten einiger Steps werden nicht als E-mail übertragen (Schritt Nr 4 und der letzte Kommentar im Schritt 5). Kann ich das Problem lösen? – gibt es ein Captcha? Habe mir das angesehen, sehe nichts ungewöhnliches im Aufbau…gibt es eine Max-Upload-Size, die das möglicherweise verusacht/beeinflußt? Captcha derzeit nicht, aber in der PRO (ab Mitte des Jahres) wird es ein Captcha geben. i am using (multi step form plugin) in my website, but I am facing a big problem. my form consist of three steps .. and when the visitors fill the form and submit it, the form is not sent completed to my email. some fields are not sent !! we have a very few Users with a problem similar to yours. We will try to reproduce the Error. Can you maybe send a screenshot, a clipping of the mail and a link to your site? I am currently testing your plugin in my WP website. I added all my steps and options to my form but when I try to save it tells me „Undefined“ . I believe it may be a problem with the characters that I used in the Labels of the steps, things like &, /, % . Are there any restrictions regarding that? Is there any way to find out what triggered that message? we do not have the resources to handle individual requests right now. 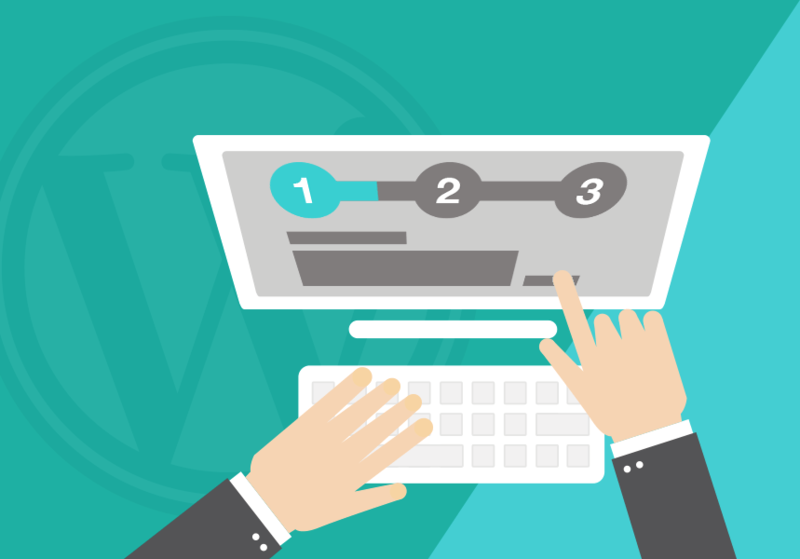 Have you tired the plugin with a fresh WordPress …maybe on of you plugins is producing the error. Disable all and try again. Hi, I am using your Plugin, and it is really great, I just want to ask if where can we edit the code, and is it possible like to put a specific page or shortcode to it, so it will be a completely step by step process for us, if yes, let me know where I can try to edit it, I appreciate it. Looking forward for you pro version, I hope in your pro version you will have this payment integration and database in backend as well as the import of csv. Hi, I’m currently using your Multi Step Form Plug in, I have created 4 separated forms with field that have required input, however the problem is that as I step through one form it seems to call the other forms and giving the error Please fill all the required fields! We’re sorry to hear about this problem. You can check if the problem still appears by creating just 2 forms (one with a required field and the other one with no required fields). We will take a look and work on it asap. Hi, Thanks for this great plugin, however is there anyway we could make it use for Multi page Forms , instead of Multi step form as the Multi steps are all on same page and look too long to fill but the multipage form will would change the user experience. This feature is not available. However, the plugin is on GitHub, so feel free to make your own changes. It’s interesting plugin, well done. Just wondering if you can hook any of the steps to do something in the back end before going to next step? I need to send verification code to a mobile that user entered and go to next step if the entered code is correct. Is that possible? It’s not possible at the moment but we will consider your request and maybe plan it for future updates. I would like to rename button name (Next, Previous, etc) and warnings to other language. It’s possible now? Is posible to Integrate this with woocomerce, like sending categories based in the form?? It is not possible to change the font-size of the form elements via backend. The font and font-size of the form adopt the settings of your theme you’re using. You can try changing the font of your theme or changing only the font of the form by using CSS. Can I setup the form so when it gets delivered to my webmaster’s inbox, the reply email to be the email address of the person who entered the email field inside the form? If it’s possible, where would I enter this code? not from the backend, but feel free to modify. 1. How can I send to multiple emails not only one. I couldn’t manage it in setting? 2. How to increase file size limit so that users can upload larger size. default is 1MB now. Is it possible to have paragraph elements be conditional so I can provide the user with further information based on a radio button choice he or she made before? thx 4 your comment, but as our conditional logic is basic at the moment this is not possible right now. My requirement is to select the products from woocommerce in first step, then ask some questions to user ( conditional ) in remaining two steps and collected data will be added to the cart with the selected products is that possible with you plugin? Hi, woocommerce can organize this with his extensions better than our form. Pur plugin is a webform and does not have woo commerce intergration from the backend right now. Is it possible to change the font on this without changing the theme fonts? Also, could you list all of the extended benefits of upgrading to the paid plugin? I can’t seem to find them anywhere. Hi, not without coding, but we will release an update in order to DSGVO wich will integrate the font and that might be easier to replace. Hi does this include any transition animation options? The demo just shows the form instantly changing to the next step, which doesn’t look good or communicate to the user that they are moving along very nicely. Eg, „swipe“ and „fade“ effect options? Nope. Not at the meoemnt but that is a good idea for further updates. what you’re looking for is a lightbox  to put your multi-step-form shortcode into. As you can put the shortcode anywhere on your page to embed Multi Step Form, this should not be a problem. Please read up on lightboxes and shortcodes for WordPress. Is possible to make a „1/2 and 1/2“ layout rather than 1/1 layout and just roll down for more contents? I tried it but I cannot find a suitable solution in your plugin. it is, we did that for customers but it is not available from the backend, it needs some coding. Hi there, it´s posible to add a payment method at the end of the form? That’s not possible via backend. Hi it all works well for me howver when you click on file upload which we are using to send photos, theres no indication to the user that there file has been attached, when i test it photos are being received as expected but many users are calling us to say its not working simply because theres no way of them telling if the file attached or not? I don’t quite get what you mean. If you upload a file it should show a checkmark with the files name. After form submit and if I click on any other internal link, I see a popup that ask me „leave page or stay on page?“. It’s this problem a new plugin issue? Nope, this is a standard info from your browser when a entered from field was not submitted. Hi we cant translate english to frensh ? Is the plugin support Right to Left? no, not from out of the box. Can each step of the multi-step from be save in case of the form being abandoned?